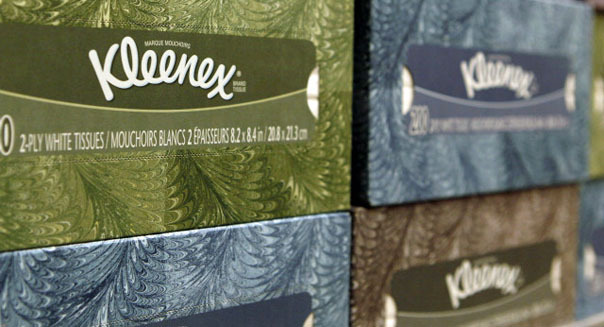 Kimberly-Clark posted a bigger-than-expected jump in first-quarter earnings and raised its forecast for the year Friday as the maker of Kleenex tissues and Huggies diapers saw strong growth in its international markets and cut costs. The company, which competes against larger rival Procter & Gamble Co. (PG) in categories such as diapers and paper products, said it cut $85 million in costs during the quarter. Shares of the company rose 2.6 percent to $104 in trading before the market opened. Excluding items such as restructuring costs, Kimberly-Clark earned $1.48 a share, well ahead of an average forecast by analysts of $1.34, according to Thomson Reuters I/B/E/S. Net income rose to $531 million, or $1.36 a share, from $468 million, or $1.18 a share, a year earlier. Sales rose 1.5 percent to $5.32 billion, topping analysts' forecast of $5.28 billion. In personal care, the company's largest segment with products such as Huggies diapers, North American sales were flat as a 1 percent price increase offset lower sales volumes. Sales of these products rose 4 percent in international markets, helped by a 2 percent price increase and growth in countries such as China, Russia and South Korea. Kimberly-Clark Corp. (KMB) said it expected to post 2013 earnings a share of $5.60 to $5.75, excluding items, versus its prior target of $5.50 to $5.65. The analysts' average forecast is $5.59. While the company has been cutting some expenses, materials and distribution costs rose in the quarter. Input costs were up $35 million from a year earlier, with increases of $15 million for fiber, $10 million for other raw materials and $10 million for distribution, it said.